The flood of alternative capital has upended the industry’s economics and if companies don’t lower their cost of capital and/or become more efficient they will have a hard time competing in a world with continued pressure on premium rates. Consequently, size and scale have become more important. Data from SNL Financial show that in the last 15 years there has been an average of 50 deals per annum; from a high of 71 in 2010 to a low of 24 in 2004. 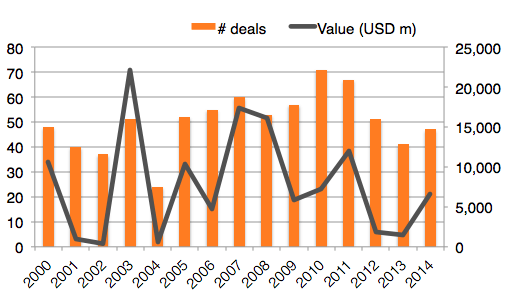 The total value of the deals during this time was $128 billion. Every industry eventually transitions from growth to maturity and the property-casualty industry is no exception. Until the mid-1980s property and casualty insurance was a growth business as new coverages were being developed for casualty risks and this, among other reasons, propelled premium growth in excess of 9% annually from the 1950s through the 1980s. But then maturity set in and premium growth slowed both in nominal and real terms and the annual rate of premium growth since the mid 1980s has only been around 3.5%. 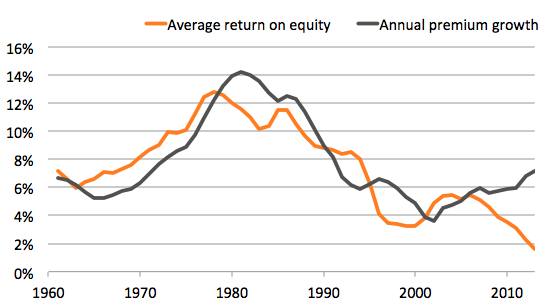 The historical relationship between premium growth and returns on equity over the past 50 years is shown below: for the most part, they rise and fall together. So absent an unexpected acceleration in the economy we now believe the industry has reached the lack-of-growth tipping point where various types of consolidations are going to be required to produce acceptable levels of profitability. To help consider what the future might hold, we reviewed many of the important M&A deals of past 15 years to help understand what types of transactions predominated and what companies were trying to accomplish. 1. While acquisitions have long been prevalent in the p/c industry, we would not describe deals as a critical strategy for most companies. 2. Most transactions are bolt on acquisitions that expand a line of business without being too big to severely harm the acquirer if the deal doesn’t work out. Few deals fit in to the category of “betting the ranch.” The equity of the target company was less than 40% of the acquirer’s equity in the vast majority of the deals we reviewed. 4. It is unclear whether deals enhance value. No doubt any company entering into a transaction thinks that the answer is “yes” but data to prove this is generally inconclusive. What kinds of deals have there been? To study the types of merger and acquisition transactions that have occurred in the last 15 years we looked at a representative sample of 113 deals and classified them into various categories based on what we considered to be the motivation of the buyer. 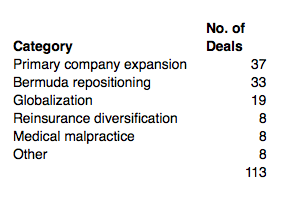 The deals we reviewed had a total transaction value of $89 billion, or 70% of the total deals during the period. For further insight we then subdivided the categories to develop a more detailed picture of what was going on. For example, we classified the primary expansion category into five separate sub-categories shown in the table below. To understand the evolution of Bermuda it is important to focus on three separate patterns 1) when and why the companies were formed, 2) how the insurers consolidated intra-island, and 3) how the companies expanded beyond Bermuda. The formation of companies in Bermuda occurred in waves in response to dramatic and oftentimes catastrophic events. • XL and ACE were formed in the mid-1980s in response to a shortage of high excess underwriting capacity in the industry. 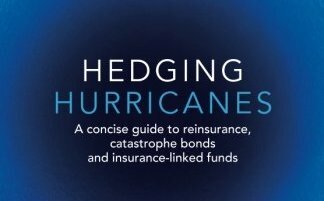 • Catastrophes, such as the aftermath of Hurricane Andrew in 1992, led to the formation of numerous reinsurers to capitalize on the opportunity created by the supply/demand imbalance for global catastrophe reinsurance coverage. • Essentially the same pattern evolved after the World Trade Center attack in 2001 and after the Katrina, Rita, Wilma hurricanes in 2005 as capacity was taken out of the industry and investors and others moved to create new companies in Bermuda. During this period structural innovations led to the formation of sidecars and other investor-friendly vehicles. 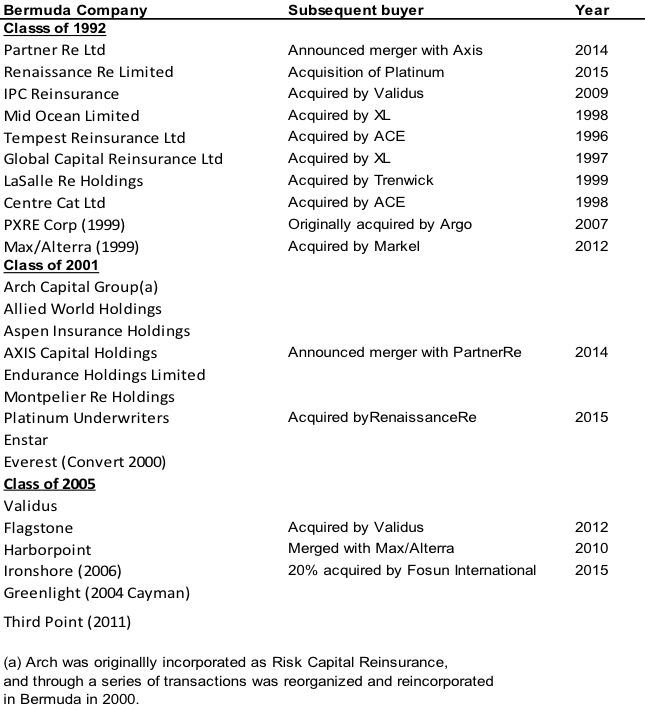 • In addition other companies were formed for specific purposes, such as to acquire run-off business or to be a hedge fund reinsurer for example. Reviewing deals from the past leads us to conclude that smaller bolt on type deals that extend business lines are the main goal of most transactions. In that regard most of the deals are not large. For example, the figure following shows that most deals are small with only 22 (out of 100 where we have deal size data) valued at over $1.0 billion. Further, in most of the acquisitions the acquired company is generally small relative to the size of the buyer. Looking at 29 deals where we have the shareholder equity figures for both the buyer and the target shows that there were only seven deals where the equity of the acquiree was greater than 40% of that of the buyer. The St. Paul/Travelers deal stands out because of an accounting convention: St. Paul was treated as the buyer even though the economics of the deal seemed to suggest that Travelers was buying St. Paul. 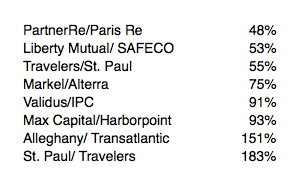 If we viewed the deal the other way around, St Paul’s equity was 54% of Travelers. Do acquisitions enhance shareholder value? As we see it, there is no clear and convincing evidence. This is partly because once a deal is completed, the acquired company is folded into the parent and the impact on reported results can’t be determined by outsiders. We tried to answer the question by looking at stock performance subsequent to the transactions but we found the data to be inconclusive. Specifically, we looked at the buyers’ stock prices at one year and two year intervals after a deal was announced. From the universe of 113 deals we could do this calculation for 53 companies, the other buyers were either not public or not domiciled in the US. What we found is that one year after the deal the buyer stocks were up an average of 11% compared to a 7% increase for the SNL US Property-Casualty Index during the same periods. Based on two year interval the stocks were up an average of 20% compared to 18% for the Index. Clearly these numbers are slightly positive but, in our opinion, far from persuasive. So, in our minds the question of whether acquisitions enhance value remains largely unanswered. Nevertheless, acquisitions are a strategic option that all companies will have to consider as they contemplate their growth and return prospects in the years ahead. Assured Research is a research and advisory firm dedicated to delivering highly customized, actionable research and analysis to insurance professionals. Assured Research marries rich industry experience, extensive industry relationships, and independence to deliver unique insights. Other recent articles on the M&A activity include One plus one=equals? and Is bigger better?